Definition 5.2.1 Let and be two sets and be a mapping from to . The mapping is injective (or is one-to-one, or is an injection) if every element of the range has at most one pre-image in by . 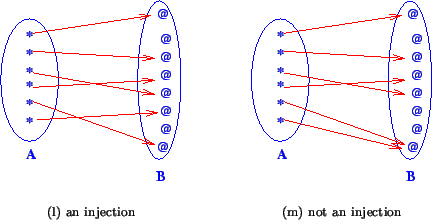 The diagram in Figure 3(a) determines an injection and the diagram in Figure 3(b) determines a non injective mapping. Figure 3: Injection or not. Example 5.2.3 The mapping such that is not injective, as there exists pairs of distinct reals which have the same square. For instance, . Proposition 5.2.4 Let , , be three sets and let and be two mappings. If and are injective, then is an injection. Proof. Let and be two elements such that , i.e. . As is injective, we have: , and as is injective it follows that . This proves that is injective. Proposition 5.2.5 Let , , be three sets and let and be two mappings. If is an injection, then is an injection. Proof. We use a contrapositive argument. Assume that is not an injection, i.e. that there exists two different elements and in such that . Then , i.e. . This proves that is not an injection.